Whether you want to choose a special personal devotional for some quiet time of day or some quiet space alone outside, or you want to choose some prayers or songs for community worship, there are great resources to help you praise God for the gift of God’s creation and to encourage us all in our responsibility for protection and care of it. This never has to be on a designated day or Sunday, but the truth is these days help give us a focus and a reminder. If you weren’t able to use the World Day of Prayer bulletin insert last year, provided by Presbyterian co-pastors Bruce Gillette and Carolyn Winfrey Gillette, it is still a great resource for the World Day of Prayer (click here). If you haven’t yet used the “Environmental Justice with Indigenous People” resource, for personal study or for corporate worship, this excellent resource is highly encouraged. 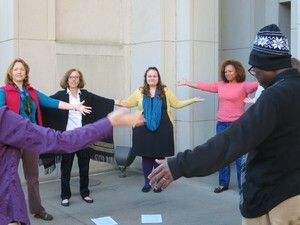 Other prayer, song, and worship suggestions can be found on our web site page on worship and eco-justice. Notice the tab across the top for samples of orders of worship. A “Season of Creation” has also been created from September 1-October 4, for those who want to look into a longer period of commitment and prayer. 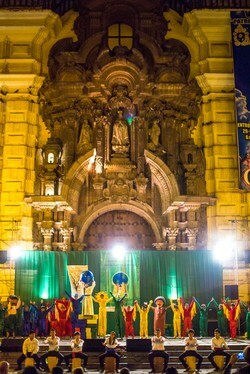 Photographer Joe Tobiason captures the interfaith prayer vigil on climate change in Lima, Peru, location for the UN COP 20.